The history of the leaves with the file prefixes DLC297c and DLC297b (1871a:297c/102-15, 297c/120-32, 297b/116-19, 297b/132-63) is difficult to reconstruct, being both complex and not fully documented. After Waller completed his work with these leaves in 1874, it is most likely that the leaves (with one exception) passed to the Livingstone family. The family then gifted these leaves to the Scottish National Memorial to David Livingstone (now the David Livingstone Centre), although the date is uncertain. The gift might have been made as early as the late 1920s when Anna Mary Livingstone Wilson (then Livingstone’s only surviving daughter) and Hubert F. Wilson (Livingstone’s grandson) began to "gather & preserve for future generations all the principal relics of Livingstone in the Birth place at Blantyre" (MacNair 1928). However, it is also possible that the gift was made after Anna Mary Livingstone’s death in 1939, or even after the end of World War II (Wilson 2011). The leaves remained at Blantyre until at least 1975 (Cunningham 1975). Figure 1. 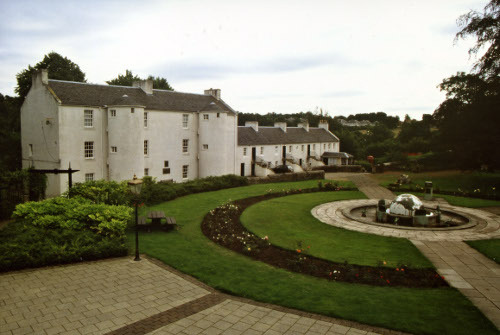 The David Livingstone Centre, Blantyre, Scotland. The leaf that contains 297b/116 (recto) and 297b/117 (verso) represents the exception to this history. As noted on a previous page, the Last Journals include a partial facsimile of 297b/117. It appears that after the Journals was published, this leaf entered the possession of John Murray III, the publisher, and remained in the Murray family until early 1929. At that point, Sir John Murray V, the grandson of the publisher, agreed to provide this leaf together with two manuscript volumes of Livingstone’s Missionary Travels (see Clendennen 1979:265) to the Memorial "on indefinite loan" noting that "the bit of newspaper" was "fading" and would "have to be kept in a dark place when not actually being examined" (Murray V 1929). The Memorial formally received the leaf on 16 August 1929 (Cunningham 1975). When in 1972 John Murray VI requested the return of the leaf – which he described as "[o]ne frame containing a portion of the journal written in Africa on a sheet of the Standard newspaper with juice from local plants instead of ink (a rather curious item)" (Murray VI 1972) – representatives of the Memorial asked for a delay in the return. A lengthy correspondence ensued, as Murray pressed his request. The exchanges between Murray and the Memorial, which still exist in the DLC "Correspondence Archives," culminated in Murray being informed that the leaf had been "‘misplaced’" (Cunningham 1975), and as late as 2009 John Murray VII indicated that he could not locate any record of what happened to the leaf (Murray VII 2009). Figure 2. 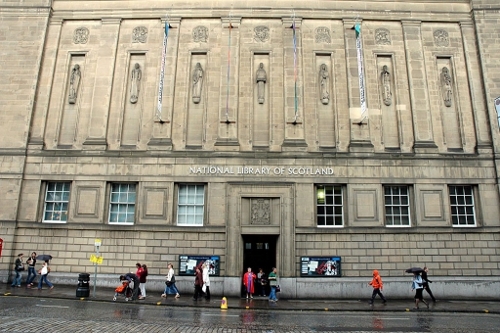 The National Library of Scotland, Edinburgh. Yet evidence elsewhere indicates that by the late 1970s the John Murray Archive in London not only held the "‘misplaced’" leaf, but, intriguingly, all the other leaves that make up the Nyangwe Field Diary proper. This evidence suggests that Memorial representatives eventually found the leaf and provided it to the National Library of Scotland, where the all the leaves of the diary were copied for the NLS as part of the Livingstone Documentation Project (Clendennen and Casada 1981). As a result, for a time the NLS held the complete set of originals alongside photocopies under the shelfmark MS.10717. Finally, the NLS – erroneously it appears – handed the entire set of original leaves to the John Murray Archive: "The originals, at one time part of [the MS.10717] deposit, have since been returned to the owners, John Murray, publishers, London” (Anon. 1992,8:157). 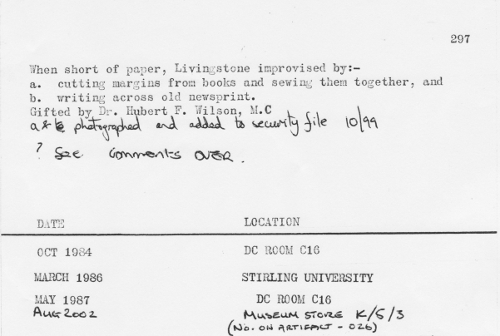 These details, in turn, correspond to the information in the Livingstone Catalogue of Documents. The Catalogue places the leaves in the Murray Archive while also noting that they were previously held by the Memorial (Clendennen 1979:277, Field Diary 37). Unfortunately, the relevant portion of the "Slip Catalogue" – i.e., the original notes which Gary Clendennen and Ian Cunningham used to produce the relevant entry in Catalogue of Documents, and which Clendennen was kind enough to copy for Adrian S. Wisnicki in 2010 – provides no further information. Whatever the case, an attempt in 2009 to find the Nyangwe Field Diary in the John Murray Archive (which the National Library of Scotland purchased in 2005) failed to discover either the leaves or any information on their whereabouts. The diary was "rediscovered" at the David Livingstone Centre (as the Memorial has also been called since 1999) only after an extensive search by Anne Martin, a volunteer archivist, at the behest of Wisnicki. Martin’s search located half the diary leaves with the file prefix DLC297b (including the Murray leaf), with the other half being found in a second, undocumented location (now DLC297c). As a result, the only clue to the full history of the diary from 1975 to 2009 comes from the DLC297b card index entry that records that these leaves (1871a:297b/116-19 and 297b/132-163 as well as two from the Bambarre portion of the Manyema Diary, 1870-71b:297b/14 and 297b/76) were gifted to the Centre by Hubert F. Wilson at some indefinite point (Wilson, Livingstone’s grandson, died on 9 February 1976). and verso (bottom). Download images as a pdf file. The entry also indicates that the leaves were transferred for conservation to Stirling University in March 1986, then returned to the Centre in May 1987, where they have remained until the present day. It is possible that the additional leaves (1871a:297c/102-15, 297c/120-32) followed a similar trajectory as they have received the same conservation treatment as the leaves with the file prefix DLC297b. Yet the card index entry fails to resolve how, when, or why in the late 1970s and/or early 1980s the Nyangwe Diary was transferred from the Centre to the Murray Archive and back again. 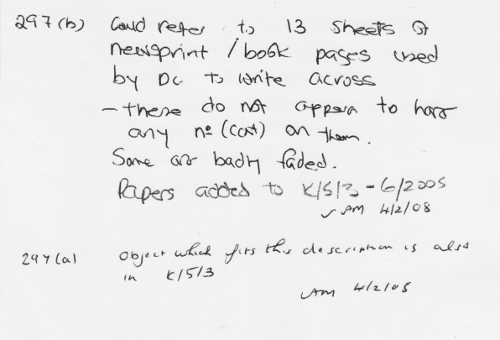 It is also not clear why the verso of the card index entry includes a handwritten addition recording "13 sheets of newsprint / book pages" when there are only 12 leaves with the DLC297b file prefix. Consequently, at this stage it is possible to provide only a partial history of the Nyangwe Field Diary leaves; significant gaps must remain until further evidence emerges. The leaves with the file prefixes DLC1120b, NLS10703, and RHOLAfrs16-1 have a much simpler, if also partly undocumented history. The leaves were probably among "the makeshift papers relating to the period in 1871 before Stanley arrived" that accompanied Livingstone’s body to England in 1874 (Helly 1987:65). Henceforth, the Livingstone family presumably took possession of the leaves. At some point the leaf under DLC1120b passed from the Livingstone family to the David Livingstone Centre, although there is no direct evidence to support or undermine this assertion. Today the leaf resides between the pages of another Livingstone copy-book relating to the same period (Clendennen 1979:276, Field Diary 33). In 1965, Hubert F. Wilson, the grandson of David Livingstone, gifted the leaves with the file prefix NLS10703, which also includes other parts of the Manyema Diary (Bambarre portion), to the National Library of Scotland. The leaves have remained there ever since (Clendennen 1979:277, Field Diary 38). At some point, probably in the late-nineteenth century, the leaves under RHOLAfrs16-1 passed from the Livingstone family to Horace Waller’s permanent possession and were among his papers when he died. "The Bodleian Library Record" of April 1940, which relates to the Waller Papers as a whole but does not discuss these specific leaves, notes that "This collection of letters and private papers belonged to the Rev. Horace Waller (1832-1896) and has been presented to Bodley by his daughters, Lady Hunt and Miss Grace Waller." Today the leaves are kept at the Rhodes House Library, Oxford University (1979:277, Field Diary 39).